Down East Homes of Beulaville has been supplying manufactured homes to Eastern North Carolina for over 32 years. We know Financing can be confusing, and we would like to offer straightforward guidelines that will make the process less stressful. • Good Credit – 0 down to 3.5% down! • Credit Score as Low as 575 – could be as low as 10% down and low payments! • Had Harder Times? We can help! 10% – 35% down, but gives you a new start! Stop By and See Our Models Today! Nothing is more important than this critical information. It is how lending institutions view you financially. If you’re thinking of financing your home purchase, go to annualcreditreport.com for your free credit score. your application. This number is not available on the free credit score. Go to: www.myfico.com (where you can order your score, plus your credit history, for $19.95). For a one-time score report – order the “Standard” report.. from any of the 3 companies they offer (Experian, etc.). Once you access the report, after seeing your credit score number – check the “Credit Report” area – it will list your credit cards and the amounts owed on them. If anything there is not accurate – call Fico at their toll free number on their website, and get your credit report correctly updated. What is the amount you are comfortable with to pay each month for your home’s financing? In compliance with the new 2014 Dodd-Frank regulations, Down East Homes is happy to provide you with this alphabetized list of lenders in the area that are most likely to offer financing for manufactured and/or modular homes. Please note this is just a partial listing of available lenders, and not representative of every lender that may offer lending in your area. You are welcome and even encouraged to contact other lenders to compare rates and benefits of various lending options. This list is for informational purposes only, and not to be considered a recommendation of any particular lender, except for the type of financing they offer (chattel or home, land/home). Please direct any specific questions about financing to your lender of choice. This information is deemed to be accurate, however, this list may be updated or revised at any time, without prior notice or consent. Or… you have not owned a home in the last 3 years? You may be able to qualify for certain benefits. 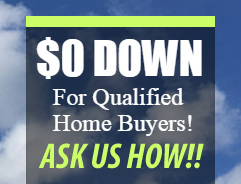 VA financing also has low down payments. Almost all active duty and honorably discharged service members are eligible for a VA Home Loan. Sponsored by the federal government, this program is designed to help first-time homebuyers qualify for a loan. An FHA loan offers a competitive rate, a low down payment and no loan fees. For 30 year, 15 year conventional, and construction-to-permanent loans. Home only financing is available; or you can finance a new home, land, fees and improvements with the same loan. It’s easy and it’s convenient. Made by mortgage lenders to moderate income families who have limited down payment capacity, these USDA guaranteed loans offer up to 100% financing on modulars. 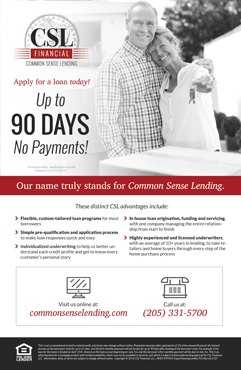 STOP BY TODAY – there are many options available to get your financing started.